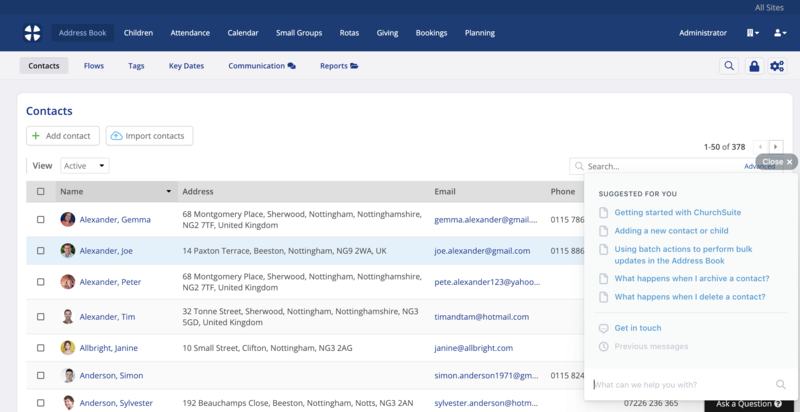 We've made every effort to create an easy-to-use, intuitive platform that anticipates the needs, expectations and workflows of our customers, but from time-to-time you'll inevitably have a question or need some help. So what help is available? ...or you can search by topic, phrase of keywords - press Enter after typing your search term to see a list of matching articles within the help beacon. ...or you can click on the article's title again to open the article full page in a new browser tab. 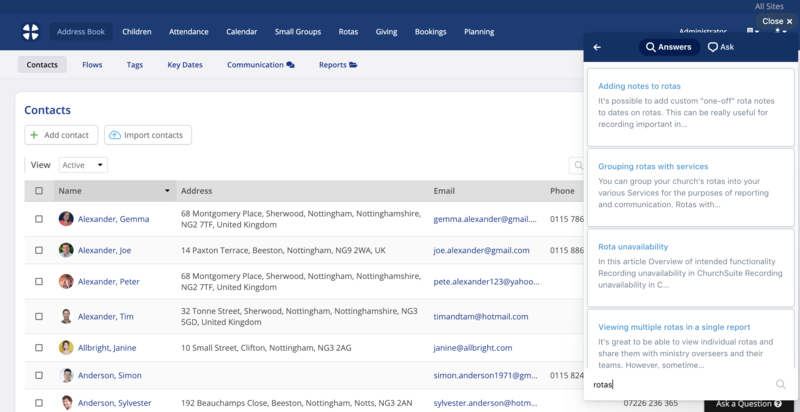 If you're unable to find an answer to your question, click on the Get in touch option within the help beacon to raise a support ticket for the ChurchSuite team. 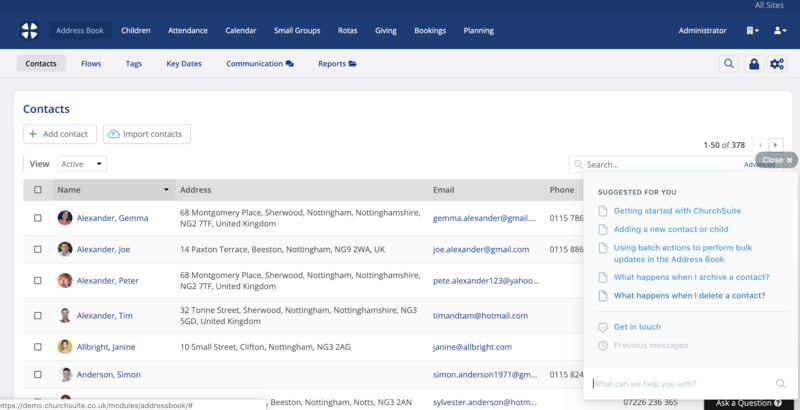 A browser cookies maintains a history of your previous support ticket requests - click Previous messages to see support responses to send a further support message to the ChurchSuite team. Note that previous messages are only maintained for as long as the help beacon browser cookie is active - clearing your device's browser cache and cookies will clear your previous messages links - although the email replies to your support requests will of course still be in your regular email mailbox. The Ask a Question help beacon is available within ChurchSuite in both browser and app environments. You may also like to bookmark the support article library in your preferred web browser: support.churchsuite.com. In addition to support articles covering each of ChurchSuite's modules, the help beacon includes a growing number of case studies, each written from the perspective of practical application - simply search in the Ask a Question help beacon for "Case Studies". 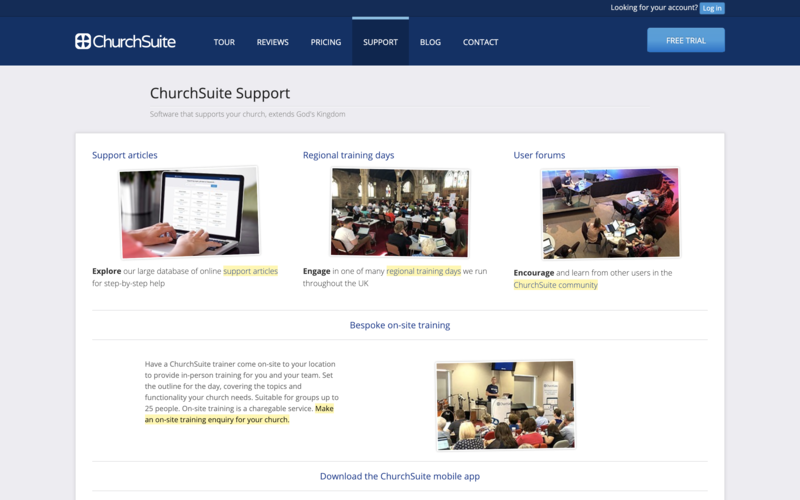 There ChurchSuite website includes a wide range of resources, including a dedicated Support section covering everything from support articles, training events, user forums, on-site training, branding resources and resources for developers wishing to use the ChurchSuite API or JSON feeds. 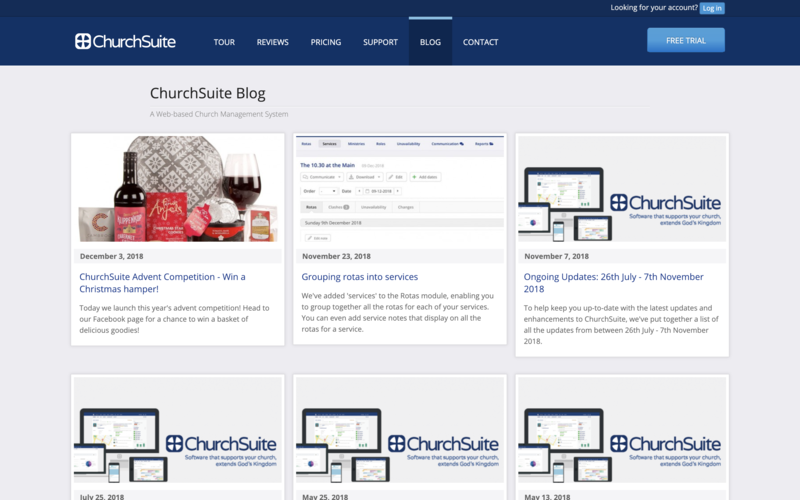 ...and stay up to date with the latest news and updates from ChurchSuite with our Blog. Is there a printed instruction manual? 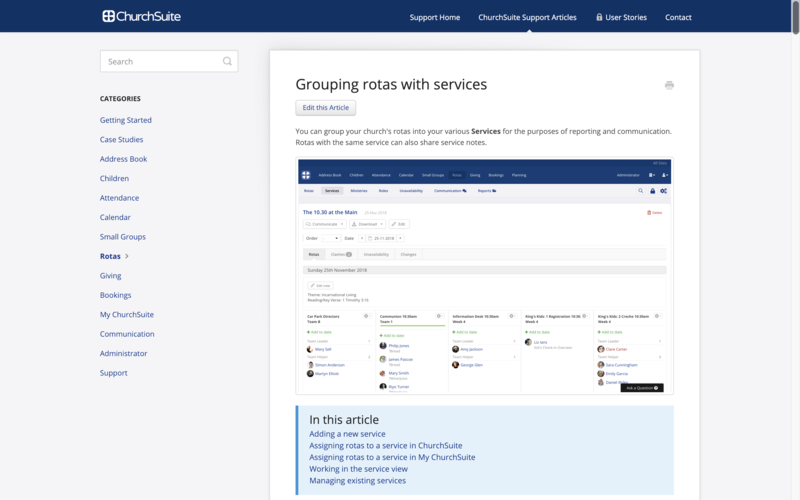 Due to the ongoing nature of development of ChurchSuite and the other parts of the ChurchSuite ecosystem (My ChurchSuite, Apps, Connect, Donate, Embed etc) it's simply not possible to produce a definitive instruction manual. 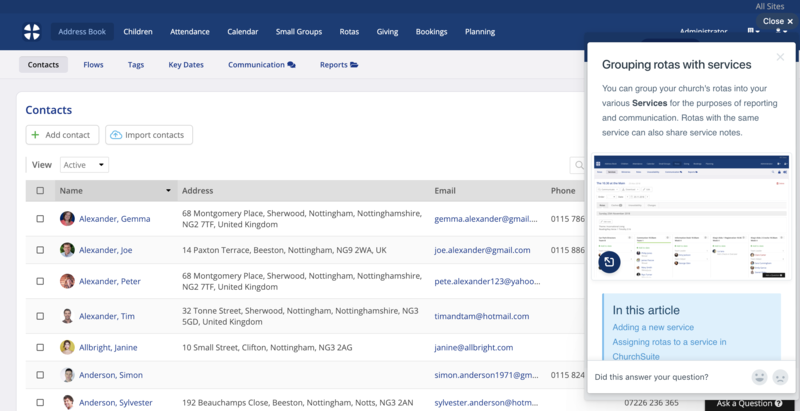 In addition to the new features we release, we're constantly refining and enhancing existing functionality too. This often results in visual changes to the user interface, which would quickly render screen shot images outdated. Sometimes, in response to customer suggestions and our own ongoing development schedule, even the original intended functionality changes over time. Similarly, changes in "best practice" security protocols and changes in legislation require changes to the platform in order to ensure compliance - for example, changes in data protection law following the introduction of the EU GDPR, or changes by HMRC in respect of UK Gift Aid rules. Consequently any printed commentary would equally become outdated. Like ChurchSuite, browsers and operating systems change; sometimes in response to bug or security fixes; but certainly as service providers pursue improvement in order to compete with other systems. An example of such a change was the move to only allow responsive enabled web sites to show in Google's search engine results. This forced a massive re-write of code throughout ChurchSuite and many things had to change visually. With every new Android, Apple, and Windows operating system release and new device, this inevitably results in changes in ChurchSuite. Yes, resist as we may, sometimes churches change too! New ministries, new staff/team, new ideas, new strategies and priorities. ChurchSuite exists to help serve churches in meeting the demands of these changes. A good example is the introduction of multi-site functionality. This feature caused radical changes through every part of ChurchSuite and any printed instruction manual that pre-existed multi-site would now be largely useless, or at best misleading. It's like the church member that prefers to cling to their 20-year old printed church contact directory - many of the people in the directory have long since changed their contact details, moved home or church, or died! Instead of a printed instruction manual, we have focussed on a more effective and efficient method of managing and communicating how to use ChurchSuite, producing online Support Articles. Support Article can easily be produced in response to a new feature and existing articles can be updated simply in response to enhancements, fixes, and changes in functionality. 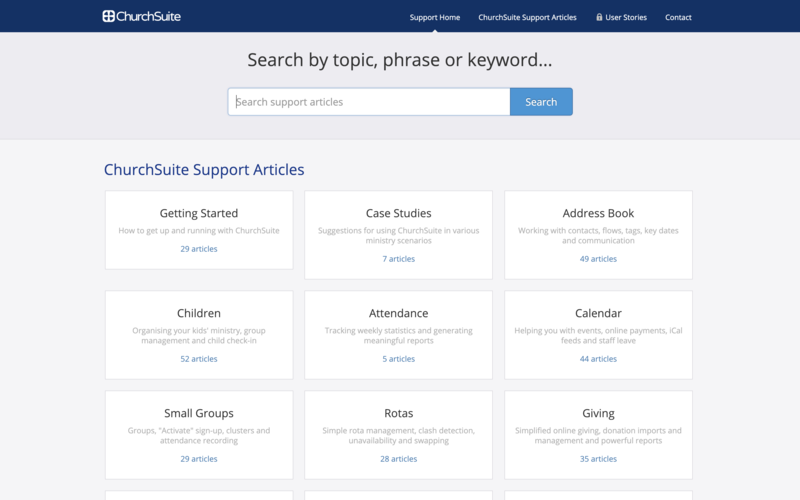 Support articles are always available from every page within your ChurchSuite account - they fully searchable and context-suggested, which means depending on what you're doing, relevant articles will be suggested right where you're working. 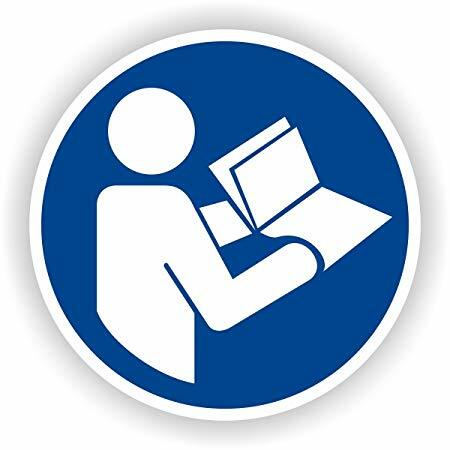 Therefore, if you do need a printed manual our suggestion is to use the "print" option (using the printer icon at the top of every support article) to print into a PDF file of just those articles you want in your manual. You can save these PDF-printed files locally on your hard drive and then compile them into an instruction manual (e.g. using a PDF tool such as Adobe Acrobat Pro). You can even annotate the articles by adding your own bespoke notes to them. Your compiled PDF manual can then be circulated electronically - we don't encourage printing hard copies as the paper usage will be huge!